The Archaeological Site of Troy is the traditional location of Homeric Troy. In the 1870s Heinrich Schliemann, excavated the area. Later excavations revealed several cities built in succession to each other. One of the earlier cities (Troy VII) is often identified with Homeric Troy. Troy is a legendary city and center of the Trojan War, as described in the Epic Cycle, and especially in the Iliad, one of the two epic poems attributed to Homer. A visit to the site of Troy was a highlight of our trip to Turkey. The local guide was quite knowledgeable and the site is well marked for understanding the various levels of the nine "Troys" including the siege of Troy 6 or 7 which inspired the foremost classic of western literature. The site is not very big, but is well worth a visit if you have an interest in Troy. The site is a bit of a jumble, as Heinrich Schleimann's excavation was hodgepodge, so it's worth it to get a map. The Trojan horse is pretty kitschy, but a fun photo op. For WWI buffs, it's worth it to stay in Canukkale to combine a visit to Gallipoli as well. 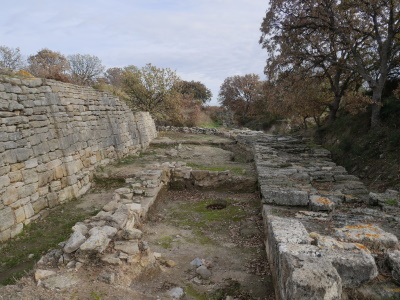 This archeological site which is assumed to be Troy named in Illiad of Homeros, actually is not one ancient city. Instead it is the ruins of at least 9 different settlements built one on the top of the other, dating back to early bronze ages. Although there is not much to see for someone who is not interested in the history and the myths; for anyone interested, this site represents a chance to take a glimpse to the wound of modern western civilization on the green skirts of Mount Ida. The Archeological Museum of Canakkale gives a chance to view some of the ancient artifacts taken from the site. The old road to Assos might be a focus of atraction cutting through the ruins of more that 20 ancient settlements predating Christ; in addition Gallipoli, with the monuments and other traces of the well-known epic drama of World War II. 3.0: Monica Tasciotti Tony H.
Blown up: Schliemann ".. caused controversy when at one point used dynamite, including the level W, presumably the ancient Troy." Recorded cultural discoveries: Charles Maclaren (Scottish) 1822 established the area, Frank Calvert (English) 1850's-60's did early excavations , Charles Schliemann 1870's provided "proof"
Early Archaeology: Excavation by Schliemann and Calvert started at 1865. It was the first time a historical text was connected to an archaeological excavation. This was also the first stratigraphic excavation. Prophecies: Cassandra, daughter of King Priam and Queen Hecuba of Troy, foresaw the destruction of Troy. She warned the Trojans about the Trojan Horse, the death of Agamemnon, and her own demise, though was unable to do anything to forestall these tragedies since they did not believe her.